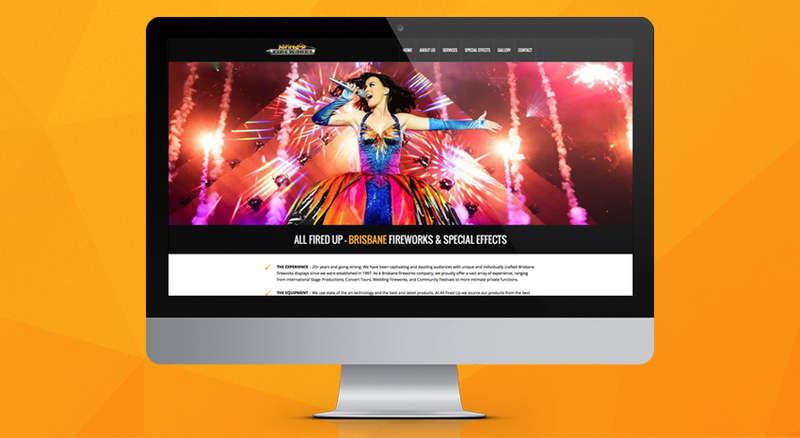 All Fired Up is one of Brisbane’s premier fireworks and pyrotechnician companies that pride themselves on producing breathtaking displays to suit any occasion. Established in 1997, All Fired Up director Paul Gianotti recently sat down with our team to discuss his online goals for his website. Wanting to upgrade his current website, Paul sought the help of our Brisbane web design team to add the extra wow factor to his online presence. While the old website was quite visually appealing, it featured some minor bugs with its responsive framework. It was confirmed that a strong focus on product imagery and the “full visual experience” was to be a main priority with the website. Our web design experts worked with Paul in designing a custom template to showcase the vast range of services and special effects All Fired Up offer. The new design features a full-width showcase slideshow and each Special Effect page features product demonstration images, allowing visitors to easily identify what each product does. WordPress content management system was chosen as the CMS of choice to allow full client control over the website and the custom template features the latest Foundation HTML5 framework. Featuring a slideshow and gallery management tools, online quote forms and a modern and unique feel, Paul and the team at All Fired Up couldn’t be happier. If you’re looking to upgrade your website with a custom template, call our Brisbane web designers today on (07) 3444 0045 or shoot through an online enquiry and we’ll be in touch.